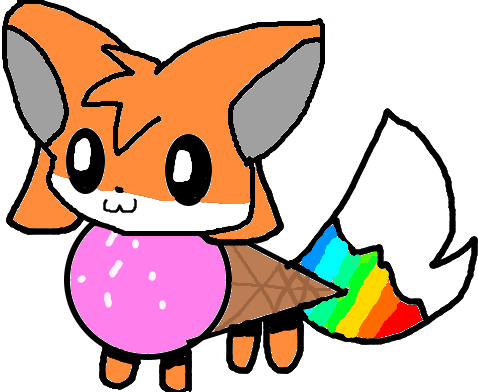 A long long time ago our world was divided by the evil forces of Tac Nayn the Evil Waffle Cat, He spread evil throughout our world causing darkness to ascend, Every Food Animal lived in this darkness until Nyan the mighty warrior used her magic rainbow to trap Tac in a space comet, never to be seen again. Nyan brought peace to the world and every Food animal lived in a world of rainbows. Nyan ran for infinity to make sure that Tac was trapped, which is why you can’t touch a rainbow. But Tac may have returned, and Nyan has begun to die, It’s up to the Food Animals to join forces to save the world and Nyan. 1. You may have only one character. 5. You cannot switch sides from Tac’s to Nyan’s. First choose what side you want to on, Tan Nayn’s (Evil) Or Nyan’s (Good) Then fill out this form and we will draw your character or you can draw your own. Now you’re set to join! Personality: Amistii is a shy yet really smart student. She is clumsy and has trouble making friends. Special Ability: Amistii can control light. Personality: Kurimu is an outgoing, playful, hyper and energetic fox. At her best, she is friendly and considerate, at her worst, she is crazy and unpredictable. Special Ability: Can spit out sprinkles and shoots out rainbow stars from her tail. Thank’s for Reading and or Joining! Location : A bunker on Casparan, heavily defended by Kas guards. Not the best thing to say on a Roleplay, if you don't like the idea, ignore it and move on. Thank you for choosing advice from FrostieBuniou, now please, have a nice day. I would redraw the character but I don't feel like it. Yay, an RP! Finally, I'm kind of out of the Grox War right now and Blackstar is kind of dead. Personality: at his best, he is shy, trust worthy ad loyal. At his worst he is calculating and has a taste for other Food Animals. Special Ability: his fangs can inject molten Dark Chocolate that can be dangerous to anything non-chocolate. He can also create a whirlwind around him self made out of crumbs. I'll try and draw him, but expect it to be a fail.